Chip: Well, for one thing, it's the wrong size. I mean, will you take a look at that ring, and think about the size of Gadget's finger for a moment? Dale: You're just jealous 'cos you didn't think of it first! Stuck without a series, the Rangers have to resort to doing kids' commercials to survive, but they're not happy about it! DALE: Will you wear my ring? CHIP: Ring Pop! It's a lollipop without a stick! A ring of flavor you can lick! #3 BOC42 - Proposing to Gadget is one thing... Chip: There is no way Gadget's going to say yes to you! Dale: I bought the ring, I brought her to Egypt, and I'm gonna propose! Chip: Dale, don't do this! Dale(french accent): Gadget, she does not want me. I shall join the Legion. Chip: So it was you who stole the ring and stopped me proposing to Gadget! Dale: I already joined the foreign legion, what more do you want? An apology?! 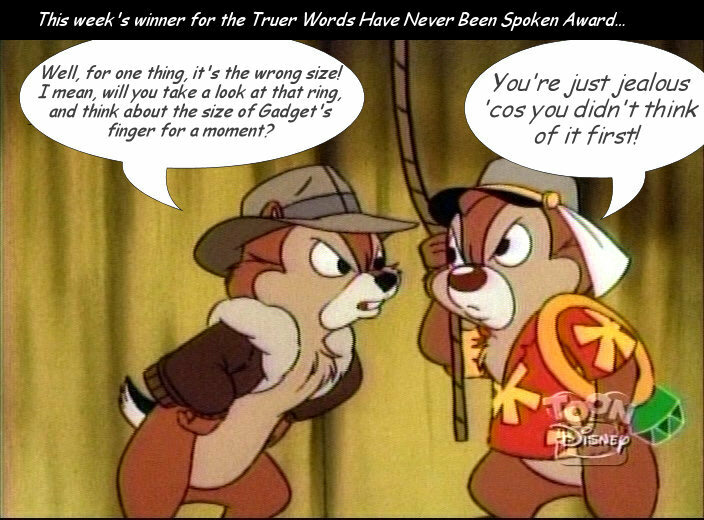 CHIP: Dale, if you have to use that Ring of Antiness to win Gadget, it only proves that you couldn't do it the right way! DALE: Right way, schmight way! At least I'll have done it! Dale; I'm getting Gadget a lime flavored candy ring for Valentine's Day. What's so bad about that? Chip; What's so bad about that? WHAT'S SO BAD ABOUT THAT? I'll TELL you what's so bad about it! I DIDN'T THINK OF IT FIRST! GIMMIE THAT RING! Chip: Dale, you've bought Clarice a golden ring. She rejected you. You bought her a diamond ring. She rejected you. You bought her a ring with TWO diamonds and she rejected you. Don't you think Clarice is trying to make a point to you? Chip: Are we running away from our secret crush on Foxglove? That's not very nice for her, y'know! Dale: What makes you believe I've got a secret crush on Foxglove? Chip: Because that ring you've snatched from Fat Cat's latest prey is a mood ring, and it's shining brighter than a traffic light! Chip: What makes you think Gadget will listen to you this time? Dale: First; we may not be able to reverse the Giganto Gun, so this ring will fit her finger. Second; she'll need someone to tell her she's still pretty, despite being 6ft tall. Third; Just look at the size of that rock! Chip: ...and your ears *still* don't stick out of your hat! Dale: Aw, you're just jealous cuz I found the Sacred Ring of Puppichu before you. Chip.- Dale I can't believe it, you a thief? Dale.- I'm not a thief!, I just carry the stolen ring and the rope for the joy of the experience. Chip: Dale, what ARE you thinking? Beige was soooo last season! And don't even get me started on the shirt! Dale: Ah, but have you seen my bling? Chip: No, Dale, you are not invisible! Chip: You dummy! You ding dong! You half-wit! You... "Clong!" Chip: Dale, we need to get out of this hole and this papyrus rope isn't going to hold the extra weight! Chip: Why should we star in this Roland on the Ropes movie?